The Sytros VR Headset was designed with comfort in mind! Sytros uses a virtual reality technology that includes SUPER SOFT & COMFORTABLE foam that supports your eyes as well as a design that fits naturally around your face! One of the most important aspects of VR is the lenses! We use only premium quality lenses to provide you with the best picture possible! Our lenses can be adjusted to your eyes and eyesight in a matter of seconds! Unlike some other VR headsets you can use ours with your eyeglasses if you would like to! Feel more comfortable taking them off? Our lenses will adjust to your eyesight! Import your own VR content into the available apps to watch your own videos in fully immersive virtual reality! We love our customers and strive for your 100% satisfaction! Give us a try! Use the headset for as many hours as you would like in 30 days. If you are not completely happy with it, we will take it back for a full refund! 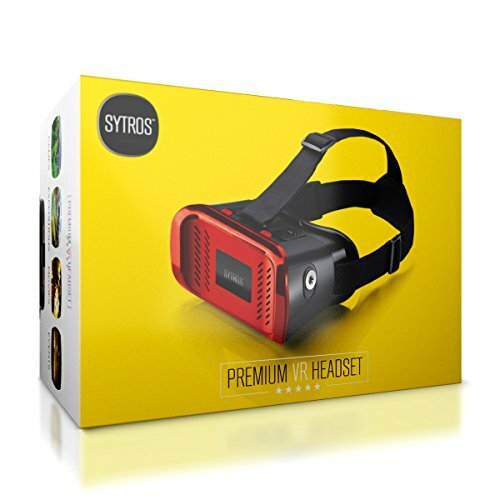 ✅ PREMIUM VIRTUAL REALITY HEADSET - The Sytros Virtual Reality headset is designed to provide you with the best possible VR experience from a smartphone! It will allow you to use any iPhone or Android to create a full virtual reality immersion experience! ✅ HIGH QUALITY LENSES - We use only premium quality lenses with the widest viewing angle possible to provide the best picture possible from a smartphone! You can easily adjust the Pupil Distance (PD) and Focal Distance (FD) to get the best 3D immersive experience. ✅ NATURAL COMFORTABLE DESIGN - Fits GLASSES! - Lightweight frame with thick comfortable foam designed to fit "just right" to your face! Do you wear glasses? Choose to wear them with the VR headset if you need to! Most glasses will fit! ✅ ACTIVE BUTTON SUPPORT (No Remote Required) - Our headset comes equipped with the external magnetic button which will allow you to pause and interact with any Google Cardboard support VR apps! ✅ ALL SMARTPHONES - iPhone & Android - Compatible with all Apple iPhone; 4, 5, 5S, SE, 6, 6S, 6 Plus, 7, 7 Plus as well as Samsung Galaxy S5 S6 S7 Note 4 Note 5 as well as other 3.5" to 6" smartphones. If you have any questions about this product by Sytros, contact us by completing and submitting the form below. If you are looking for a specif part number, please include it with your message.